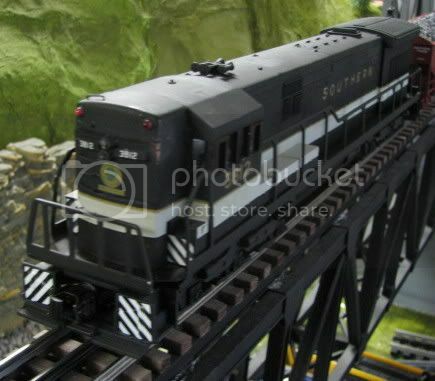 s.r.sean, i wish that i could find another southern switch tower!............rogerw. 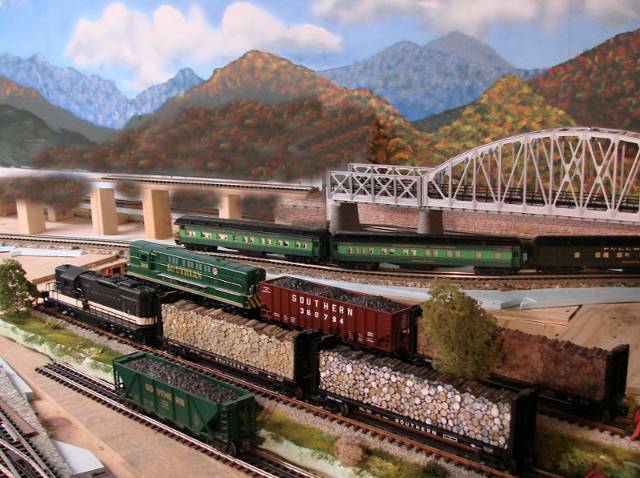 I'll have to post an all Southern Steam line up with my Lionel Southern Ps-4 #1396 and #1403,Weaver Ps-4 #1380, Lionel Ts-1 #1491, Lionel As-10 #6536,K-Line #4501 and MTH Kanawha #2716. 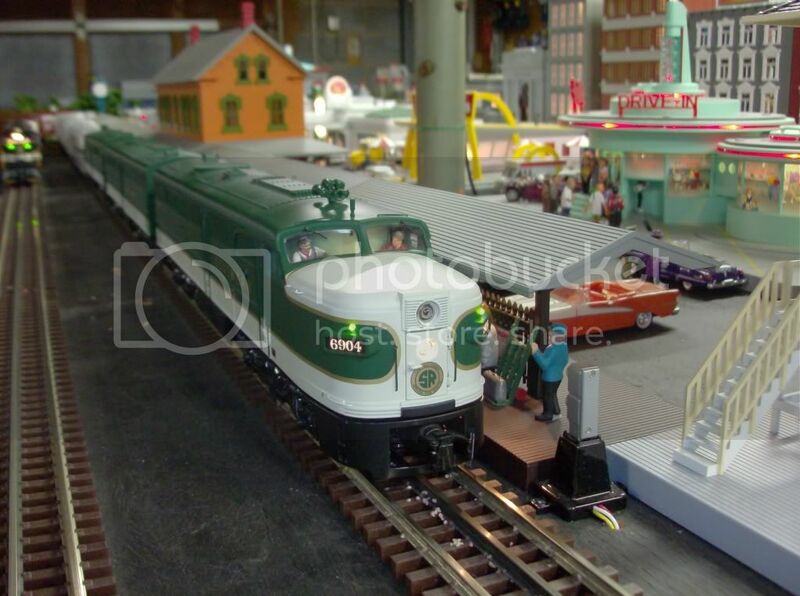 I'm in the hunt for MTH Royal Hudson #2839 when I get my bonus to be a birthday present to myself in April. I can't beleive you don't have a Southen Switch tower. 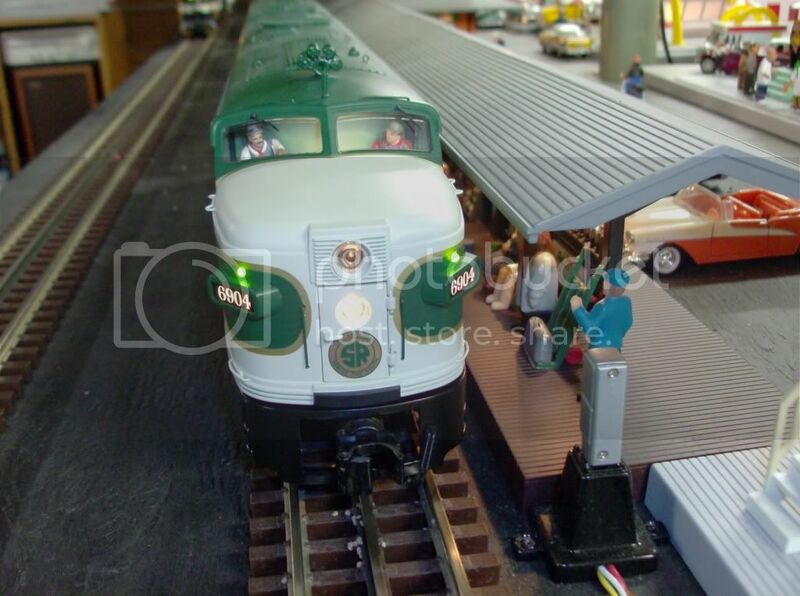 I know the Southern had one in Atlanta at Terminal Station but I wasn't based on the MTH version. I'm looking to get a my hands on a Weaver Watchman tower since there was one here in Charlotte at the old Southern Railway station. I think I'm going to change my mind and buy that MTH Southern Office building if I can find one. s.r. sean, i do have a southern switch tower! i just wanted another one!!! i think the train loft in winston-salem still has some southern office buildings left..................rogerw. I'll have to post my Stinking Diesel line up later!! Great pics guys. Can't wait to see more of your lineup. 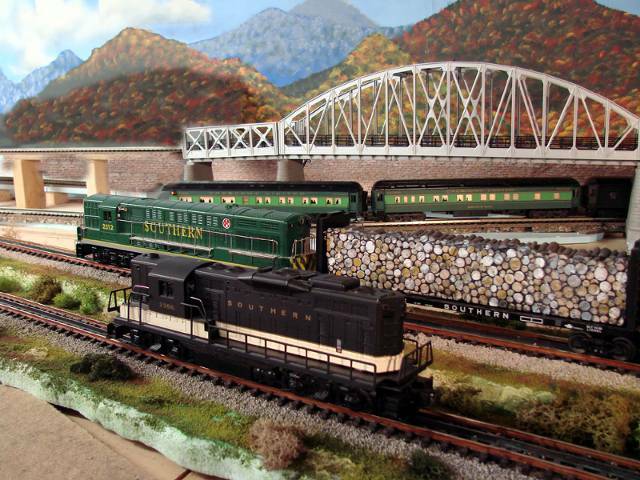 here is a picture of my mth-premier southern alco pa's...........rogerw. Roger what P.S.A are used for your PA-3 and E8'S. Wondering if they are using stations named on the Piedmont Division. s.r. sean, both of my E-8 southern crescent aba's announces stations that are on the piedmont division (washington-atlanta including greensboro and charlotte). my alco pa p.s.a announcements are for the ponce deleon station stops. my E-6 p.s.a station stops are for the tennessean and my southern F-3 had freight sounds but i changed the soundset for p.s.a. sounds. the p.s.a. station stops are for the "southerner" station stops..................rogerw. I have had the U33C and GP-30 converted to TMCC with Railsounds. Chessie Man Moving Black Diamonds from the Alleghanies to Tidewater. The Trainmaster is a Williams cab with stripes added while the GP7 is an old postwar Lionel that was custom painted many years ago. 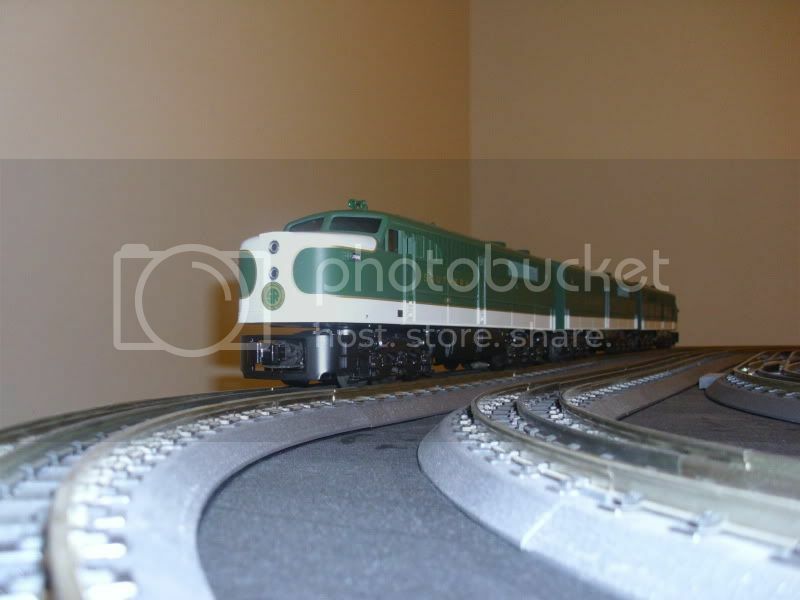 Both units are on newer TMCC chassis. Did you weatherize the pulpwood load? It looks better than what the car came with originally. c.sam great pictures!!! keeep them coming!!!...........rogerw. Yes I did Lionelman - have three of 'em and each came out different! I plan to redo the one to the rear as I didn't put a thin black wash over it as I did the other two. 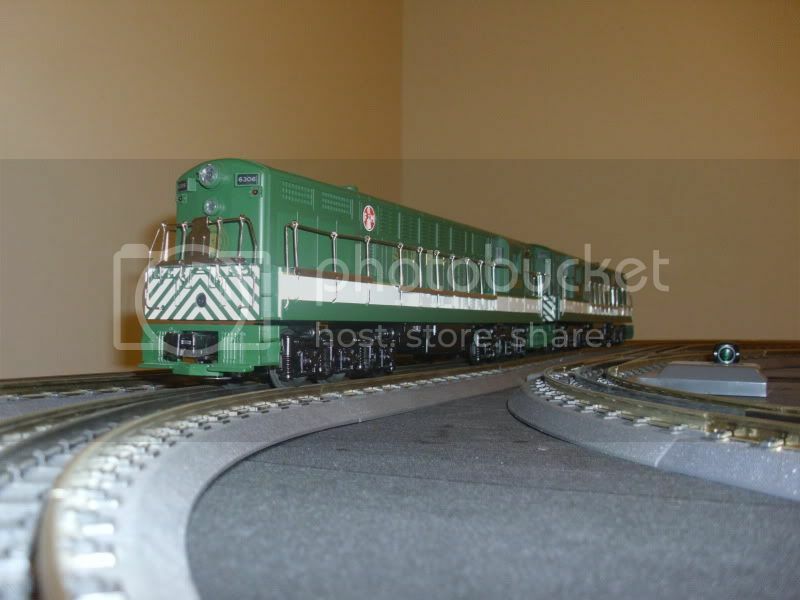 Let's keep it 'sane' and post some good photos of your SR equipment..
Forum member Bruce Clouette painted this new Weaver baggage car for us and is working on a matching MTH Express Mail car to go with it. He is one of the many talented fellas here on the Forum! Where did Bruce get the decals for this car? I have a unlettered green Weaver RPO that I want to letter Southern (the later block version, not serifed). If those decals are champs good luck in finding some. Those are some of the hardest decals to find! Nice work on the RPO! Were those Champ decals or another manufacturer? Decals were done by Eric Etheridge. My Southern Crescent Limited "Pacific" and steel caboose. Don't get in my way. "Boba Fett." 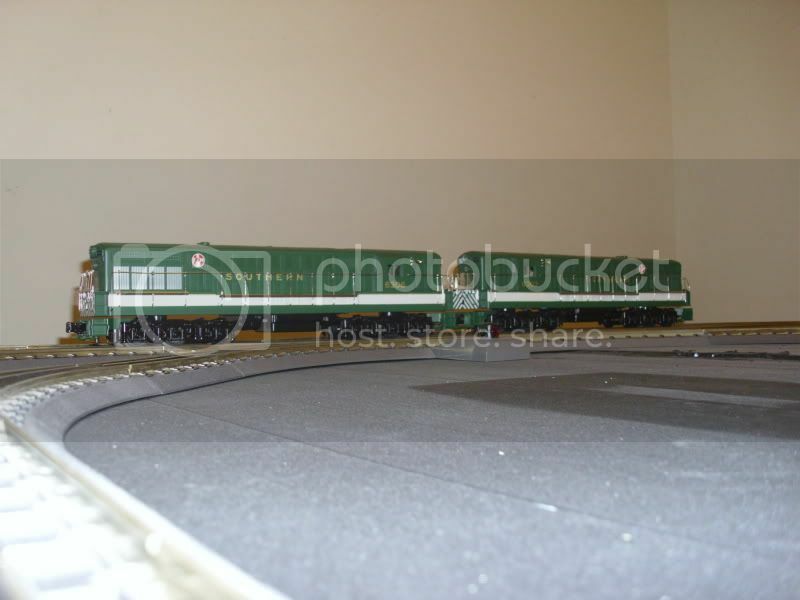 Was 1380 the only streamlined 4-6-2 Southern had? The reason I ask is I have a drawing by E.H. "Ted" Lannom (Nashville Toy Museum) that was given to me by an old family acquaintance who got it from Ted as a gift. It's a nice drawing, but the number he used on the engine is 1338. Was 1338 streamlined or did he make use of his artistic license when drawing? 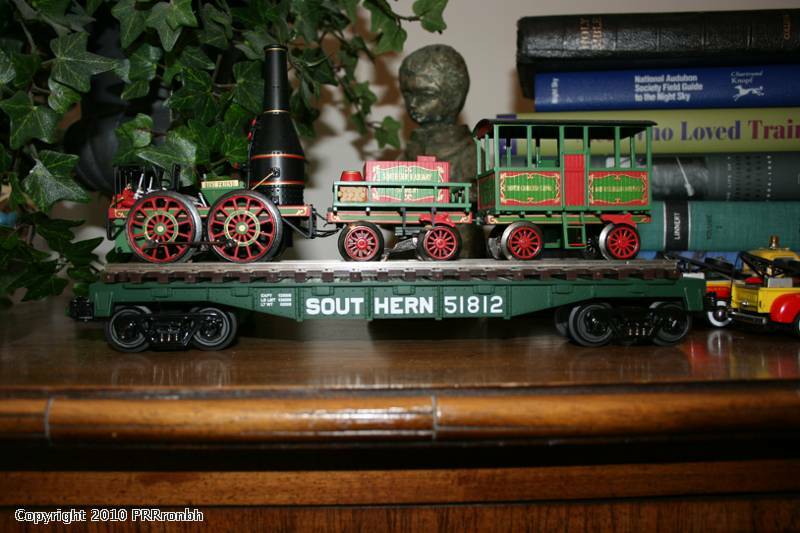 Southern #1338 was a Pacific Ps-2 class bought new from Baldwin in 1913 and retired and scrapped in 1947. It was never streamlined.It operated in workhorse locomotive black decoration for its entire career. Thanks Dewey! It's a shame he got that wrong (accident or intentional???) cause the drawing is very nice. I would say it's hard to confuse 1380 with 1338 since 1380 was a Ps-4 and 1338 was a Ps-2. 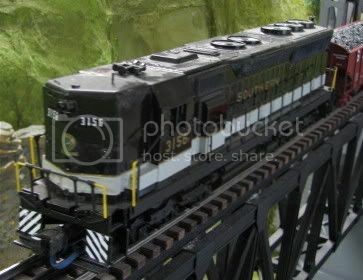 speaking of which 1380 was done in O scale by Weavers Model and as of today no manufacture has ever made a Southern Ps-2. And for those of us that's into real steam Southern 630 will be back on the rails in the spring of this year. 4501 is still under going work to get her ready and should be back on the rails in the summer. I hope I will also be back on the rails by this Summer Sean. Rust-painting railsides with a brush and then I have to ballast and do some sort of groundcover. 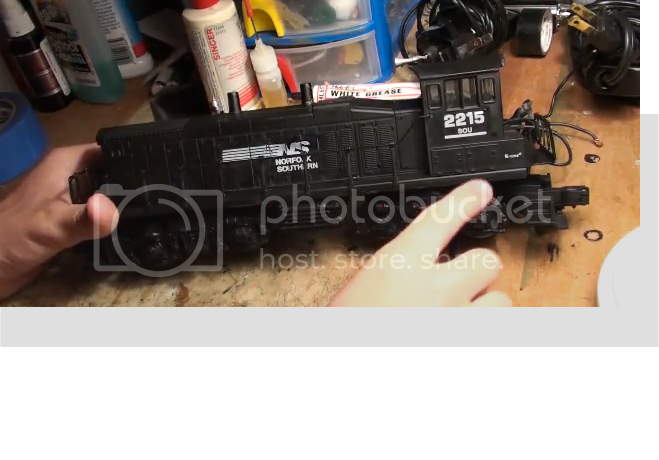 I know about the $200 "Ballast King" but even if available free it wouldn't help much since over half of my layout is Yard with clusters of turnouts plus crossovers on the dual mainlines. The Southern, N&W and A&Y trains ain't running and I work sloo..oowww! I like this one.The 3800 and 3900 GE 4 axles really weren't for the main line's like the NS tried to run'em,but they were neat looking units. They rode horrible,but I did manage to pull 169 loads of coal with a 3800 and a 3900 once.Didn't break any land speed records,but it did alright. 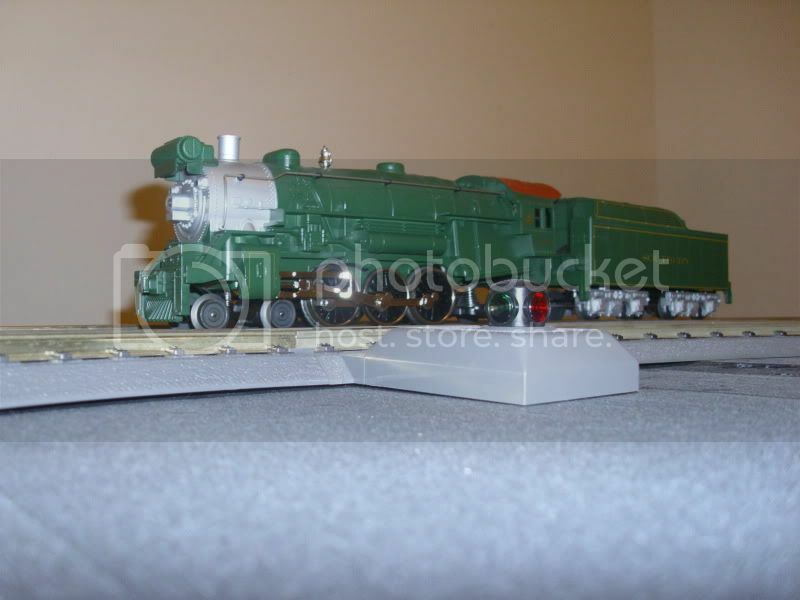 Great looking model.What did you use to make the 3800 ? Collin "The Eastern Kentucky & Ohio R.R." 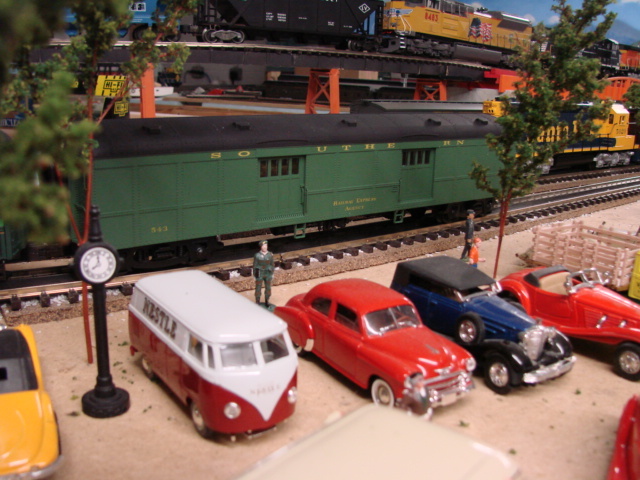 The U33C started out as a Milwaukee Road from Williams. I cut off the short low hood and built up the sides with styrene. I then glued the short hood onto the styrene sides so that it would be flush with the top of the cab. Then I repainted it and used Microscale O scale decals for the lettering. I also had it converted to TMCC with Railsounds. Well I was going to post some photo's of my Diesel motive power but my portable hard drive crashed and I lost all my pictures so here some Real Southern motive power instead. 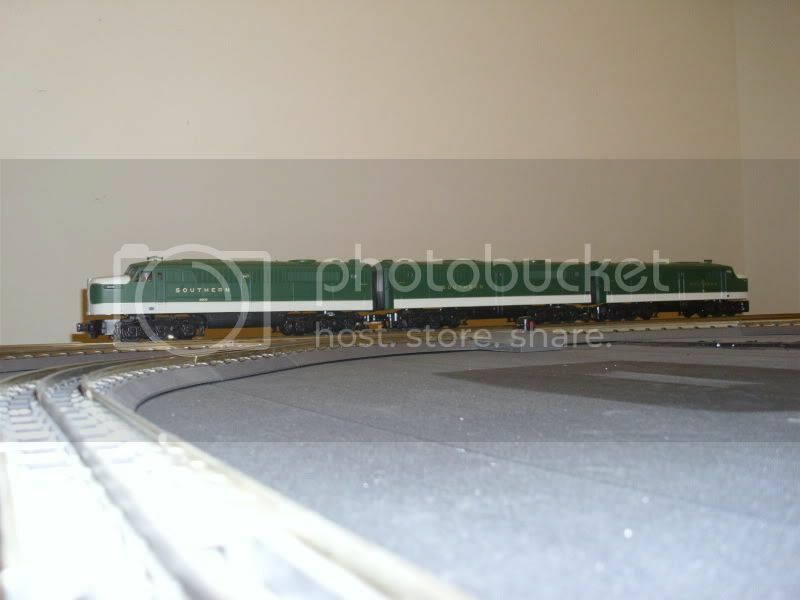 Southern FP7 and E8 leads a passenger train pass the roundhouse turntable.